Tonight was Father’s Day dinner and we had wild Pacific Spring salmon, also called Chinook or King salmon. It was served with a sauce au beurre blanc, fresh peas, and Ravioles de Romans. Ravioles are a small herb ravioli from the region of Romans in the Isère valley in France. For dessert, we had apple pie made with butter pastry and a chocolate truffle. The spring salmon was just pan-fried in olive oil. The sauce is the important part. It is the only reason my kids agreed to eat fish when they were kids, and it is still the best sauce to go with fish or seafood. Because of all the butter required, it has a special status, and is only served on big occasions. Peel three large shallots, slice them, and cook them thoroughly in non-stick pot with 1/2 glass dry white wine, 1/2 glass cider vinegar, 1 tbsp balsamic, with a lid on. The liquids will evaporate anyway and if they do, add a little water until the shallots are done. Then, you can purée the shallot reduction in the blender or put it through the moulin à légumes, or leave it be, depending on whether you want the final sauce to be like a cream or if you want to be able to feel the texture of the shallots. Next step is to return the purée to the pot and add 3 tbsp whipping cream. This addition is not part of the original recipe. However, it taste good and it makes the sauce much easier to make. 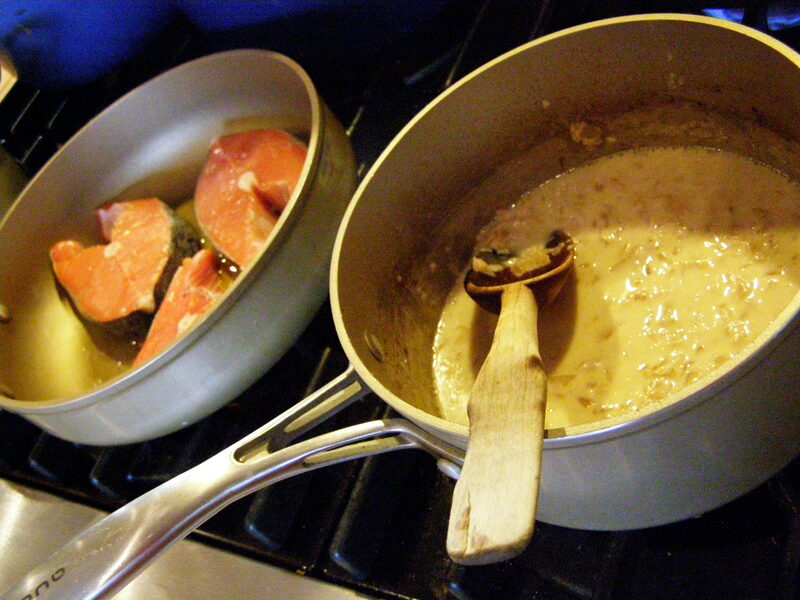 Most cooks are afraid of beurre blanc because when one does not add that little cream, the butter has a tendency to separate and turn into oil. It is then spoiled. 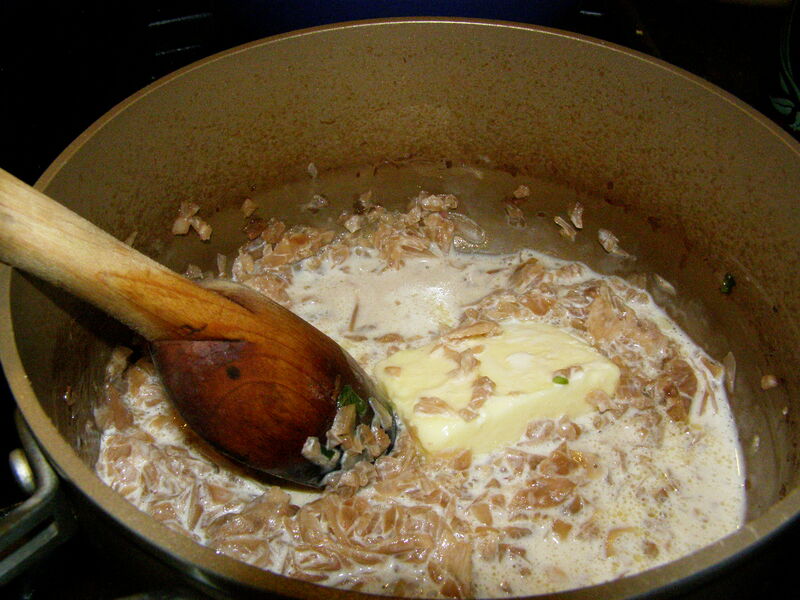 Under very low heat, stirring clockwise constantly with a wooden spoon, add small pieces of butter one by one. The butter melts and joins the emulsion and looks like a white cream. Add at least 1/4 cup butter, more if you need a lot of sauce. Add salt and pepper. Stir until it thickens to your liking. Never let come to a boil. The trouble is, unless you have help in the kitchen, you can’t be stirring and cooking dinner at the same time and sometimes the butter will turn into oil. If this happens, I know a little trick that can save the sauce, and the day. Just add about 3 tbsp almost boiling water to the sauce and stir vigorously, the sauce should be saved. If this fails, you can also add a little bit of cream and stir. At the last minute, pour some sauce over the salmon on heated plates. This sauce is excellent on lobster, scallops, halibut, crab, salmon. It is quite rich and is usually reserved to go with noble (ie expensive) fish or seafood. Whenever my parents had guests, I was hired to stir the beurre blanc and yes after you have done it so many times, you get a good hand with it. There is this phrase in French, when somebody achieves something difficult , you say Chapeau!, meaning I tip my hat to you. Now this is for my good friend Jim Doak in T.O., if you can make beurre blanc, I will give you the hat! 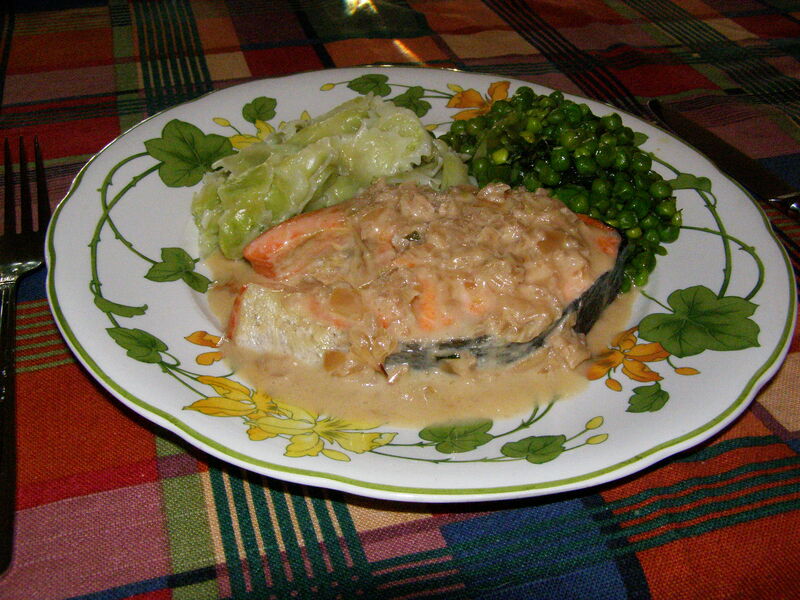 This entry was posted in Main Course and tagged beurre blanc, chinook, cooking, dinner, food, France, king salmon, recipe, recipes, spring salmon. Bookmark the permalink.